Converts low-swing AC coupled differential input to HDMI 1.4a compliant open-drain current steering Rx terminated differential output. HDMI TMDS level shifting operation up to 1.65Gb/s per lane (165MHz pixel clock). Enable feature to turn off TMDS inputs and outputs and to enter low-power state. Transparent operation: no re-timing or configuration required. Switching power only from a single 3.3V supply. Integrated 50-ohm termination resistors for AC coupled differential Inputs. Pass-gate voltage limiters allow 3.3V termination on GMCH pins, 5V DDC termination on HDMI connector pins. Human Body Model ESD protection: 8kV for all output pins and 2kV for all other pins. Level shifter for HDMI 1.4a HPD. Integrated pull-down resistor on HPD_SINK input guarantees “input low” when no display is plugged in. Offered in a 48-Pin QFN Package. CH7318C is a high speed HDMI level shifter that converts low-swing AC coupled differential input to HDMI 1.4a compliant open-drain current steering Rx terminated differential output. The CH7318C features integrated parallel termination resistors (50-ohm), which eliminate the requirement for external termination resistors on the TMDS differential output pins. This device has incorporated a ESD protection for DDC channels as well as TMDS signal lines. 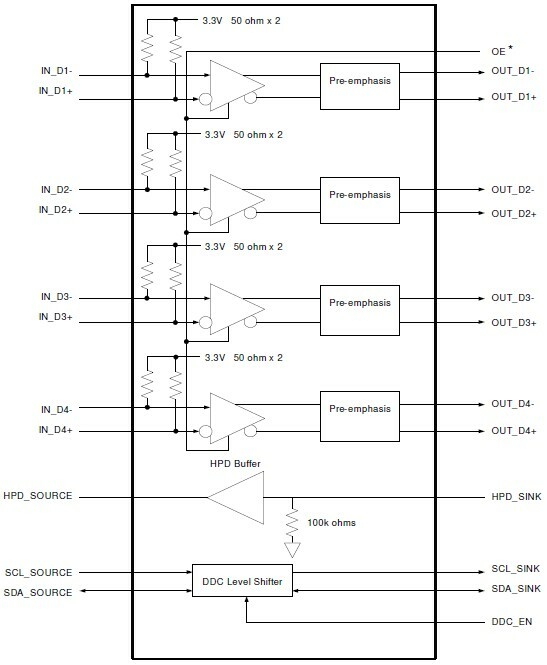 In addition, the DDC_EN pin controls bias voltage to enable or disable the DDC passgate level shifter gates. The OE* pin is a two- state output enable control for the differential input and the TMDS signal output. It can activate IN_Dx pins and OUT_Dx pins or switch them into high impedance. A unique pre-emphasis control is also implemented into CH7318C; this feature has four-level adjustment to increase rise and fall times which are degraded during the transmission over a long trace on PCB. The device operates from a single +3.3V supply, and is characterized the operation temperature range from 0 °C to 70 °C (ambient temperature). The CH7318C is available in a 48-Pin QFN package.